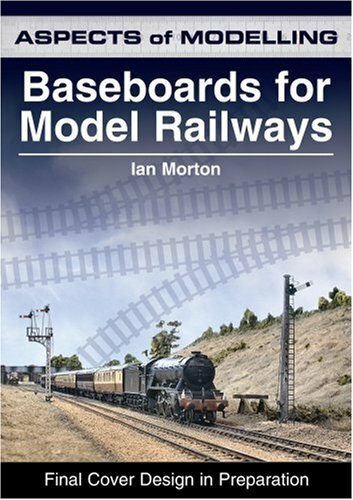 Baseboards for Model Railways by Ian Morton is a good guide to a subject matter that can make or break a model railway layout. The book is just as applicable to the “benchwork” of a US railroad as the “baseboard” of a European railway. Ian introduces the various construction approaches commonly used in a clear easy to follow way in a series of of step-by-step how-to sections that are well illustrated. The book also has good information about tools and materials needed to get the best results. Finishing touches aren’t neglected, with information on fascias, legs, and joining and aligning portable baseboards. There’s even tips for minimising weight whilst maintaining rigidity. Baseboards are the foundation of every model railway and if poorly made can lead to much frustration, disappointment, wasted time and money. Despite this, many modellers often skimp or rush their construction in their eagerness to get on with the more interesting parts of building a layout. The book gives a complete introduction to the basic tools, materials and techniques needed to construct a foundation for a layout of any size or scale. L-girder for unusual shapes and massive landscapes. Baseboards for Model Railways will appeal to both beginners to the hobby and those who are about to embark on the construction of a new layout. It offers a useful reference guide to the wide variety of baseboard types and materials available to today’s railway modeller and anyone returning to railway modeling after a long gap will find the discussion of new materials that are now available very useful. The only downside, if there can be said to be one, of this book is that it isn’t either a reference document or a source of inspiration. You will read it, plan and build your baseboard, and never return.